When the Lord Jesus had lived for thirty years from His birth in the flesh, He began His teaching and saving work He marked this very beginning of the beginning by His Baptism in the Jordan. 'The beginning of the world -- water; the beginning of the Gospel -- the Jordan." At the Baptism of the Lord in the water, that mystery was revealed to the world that was predicted in the Old Testament and fabled in ancient Egypt and India -- the mystery of the Holy Trinity of God. The Father revealed Himself to the sense of hearing, the Spirit to the sense of sight and the Son, further beyond these, to the sense of touch. and when he immersed the Lord in the Jordan and baptised Him, there were thus revealed both the mission of Christ in the world and the path of our salvation . That is to say: Christ takes upon Himself the sin of the whole human race. He dies under it (the immersion) and rises again (the coming up out of the water), and we must die to the old, sinful man and rise again, cleansed, renewed and re-born. Here is the Saviour and here is the way of salvation. 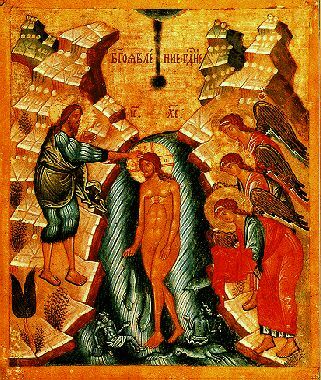 The Feast of the Theophany is also called the 'Illuminating', for in the Jordan there is given to us an illumining, revealing God to us as Trinity, consubstantial and undivided. That is one thing. And the other is that each of us baptised in the water is illumined by the Father of lights, through the merits of the Son and in the power of the Holy Spirit.